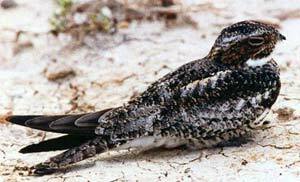 The Nighthawk - It flies at evening, and hides itself during the day from the bright light of the sun. believe this is the only animal of any kind mentioned in the Bible, the name of which begins with N.
It is named in the 11th chapter of Leviticus, among other birds, such as the owl, the cuckoo and the raven, which the children of Israel were not allowed to eat. It is somewhat like the owl in its shape, and in its large, full, round eyes. It flies at evening, and hides itself during the day from the bright light of the sun. It likes to live in lonely, dark woods, and when it comes out at twilight to get the insects that it lives upon, you could hardly hear the sound of its wings, it flies so very gently. It has a very wide, gaping mouth, which helps it to seize upon moths and flies, and its mouth is bordered with a row of stiff bristles, so that the insects may not escape again after they have been caught. The night-hawk belongs to the same family with the whip-poor-will; and, like that bird, it places its eggs on the ground in the shade of some thicket, with only a layer of withered leaves under them instead of making a nest.